It is important to encourage students’ vocabulary development so that they have the necessary language and skills to succeed in communicating and understanding any language. One way of implementing this strategy in the language classroom is to incorporate a number of opportunities for students to reflect on words they already know, have exposure to words they should know, as well as have the opportunity to use and recycle this vocabulary in ‘authentic’ conversations and interactions. 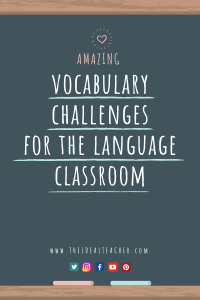 Vocabulary challenges are a brilliant way to get students focused in the language classroom and showcase their knowledge. In addition, these activities also allow learners to acquire even more knowledge from their peers. Students will have the ability to reflect on what they know if they work individually. However, if they work in pairs and in small groups, they will also learn new words. 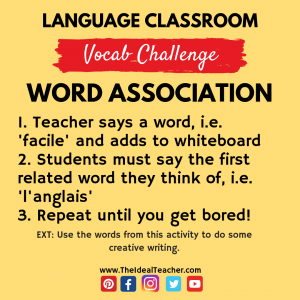 Combining this reflection, as well as exposure to new words regularly, along with recycling this vocabulary in classroom activities and homework will aid language learners to have more vocabulary to communicate. 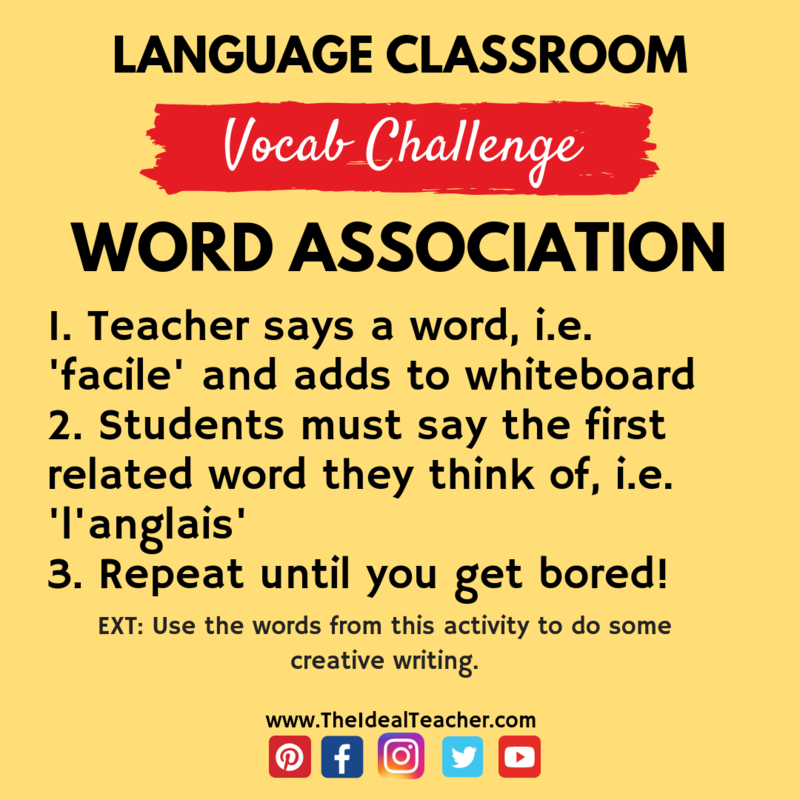 The purpose of this post is to collate a variety of vocabulary challenges (which I will add to over the coming weeks) that you can easily use in your language classrooms, at any time of the academic year. The vocabulary development activities are perfect for the French, German and Spanish Key Stage 3, 4 and 5 classrooms in England, but also ideal for English Language Teaching classrooms, as well as any other language teaching classroom anywhere in the world! 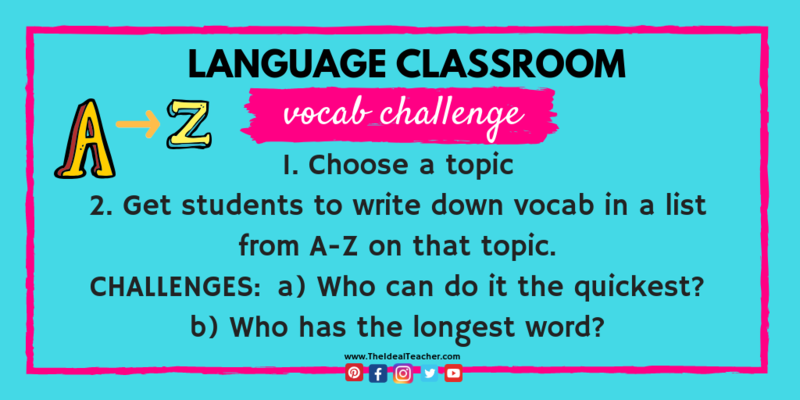 Try the vocabulary challenges below out today and feel free to add any ones that we should be using in our classrooms in the comment boxes below! This could be easily adapted for all of your classes and it could be used regulary, but with some adaptations to keep things fresh. For example, change the ‘two vowels’ to ‘three vowels’, or the ‘vowels’ to ‘syllables’ etc. How many words can you write down beginning with any letter of the alphabet? 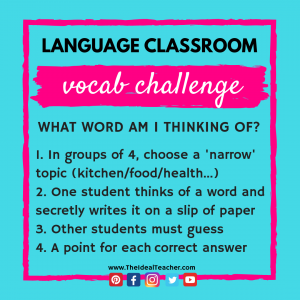 To make this vocabulary challenge topic-related, add a theme that the students must stick to. I love this vocabulary activity, as it can be used with all levels for pretty much any topic. Food and drink springs to mind, as well as ‘verbs’ and so on. I am working on the topic of health and safety with my current ESOL students and I tried this out with them. Would you have thought of ‘fire extinguisher’ for ‘F’?! 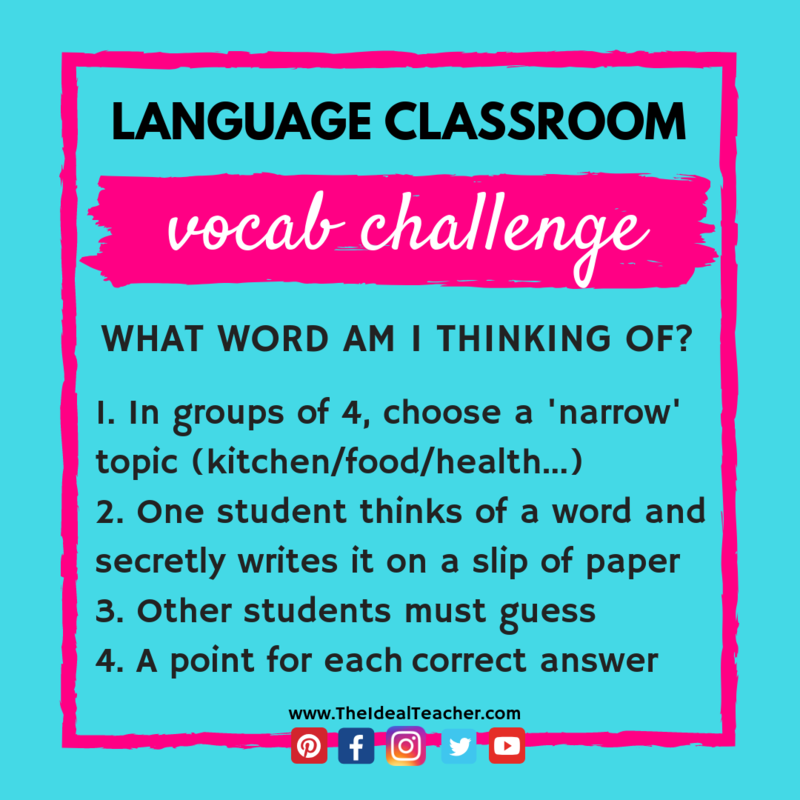 I first came across this vocabulary activity in my first year of teacher training, when the Head of French used it as a plenary at the end of her lesson on restaurant food and drink. 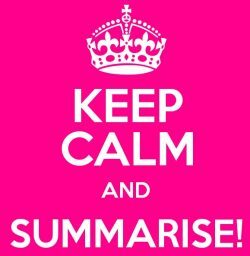 The year 8 students loved it and the vocabulary challenge got the students really involved in recalling the words that they had come across in the lesson. 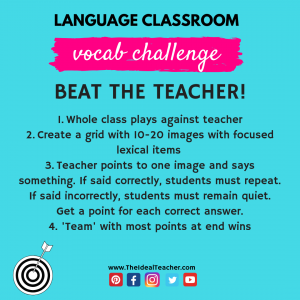 This teacher used the activity as a plenary with the whole group, but I think it would also work well in small groups, using the same principle. 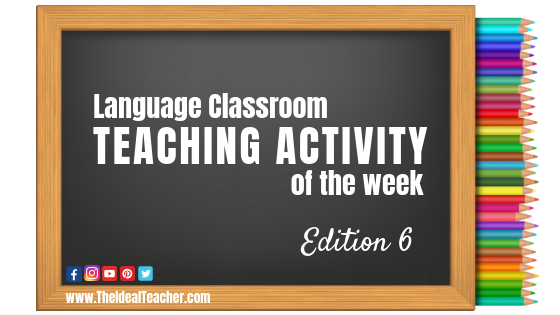 This activity is an oldie but a goody and can be used to develop vocabulary and pronunciation for all students. 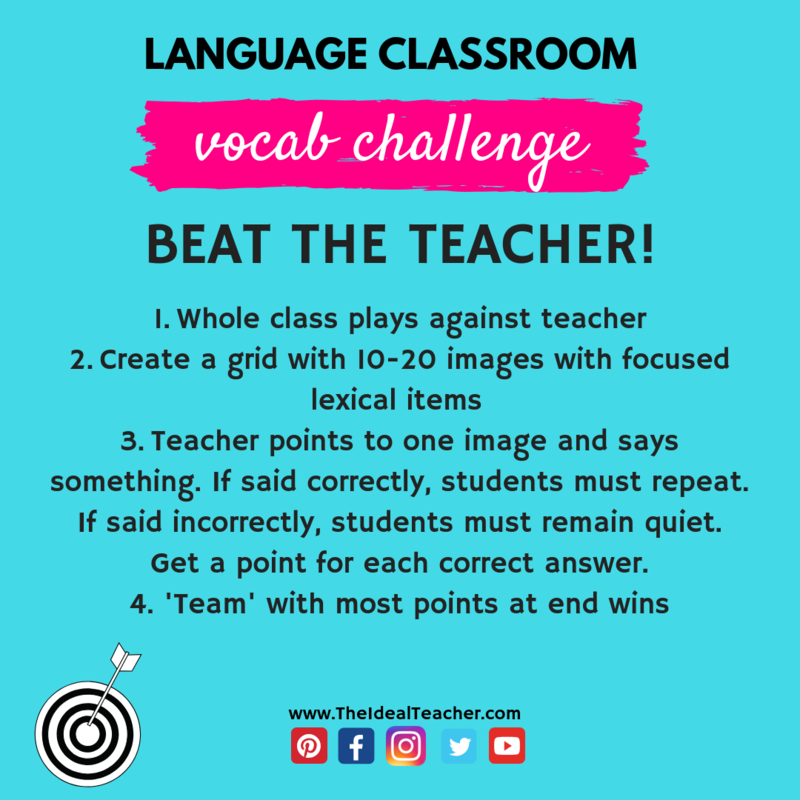 This is one version of ‘beat the teacher’ with a competitive element, but there are also many variations of it. Create a PPT slide with imagery of vocabulary items in a grid. The students and teacher start off with 10 points. Point to an image on the grid and say it in the target language. If you say the word that represents the image correctly, then the students must repeat it. If you say a different word, or pronounce it incorrectly, then students must remain quiet. If anyone repeats the wrong word, then the teacher gets a point, if all students stay silent the class gets a point. 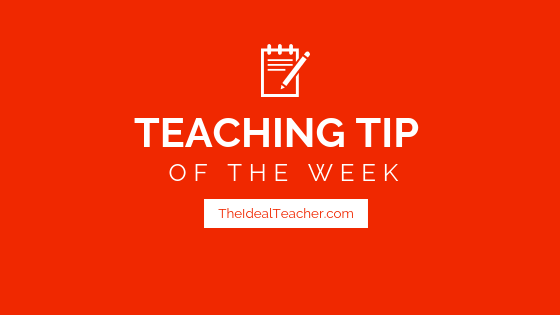 Tip: Get a reliable student to keep a tally chart of the marks. To decide on a winner, you could set a time limit, or the first ‘team’ to get to a certain number of points. If the class wins, you could let them out a minute early, or give them another type of prize. I find this kind of activity works really well to get whole groups engaged and it’s an excellent way of drilling with a competitive edge. 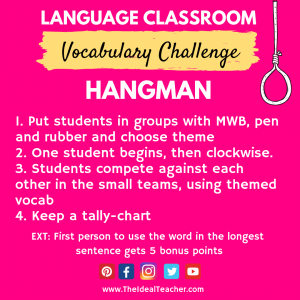 I tried this creative vocabulary challenge out today with my English students recently and they loved it! The students got extremely inventive with the vocabulary that popped into their heads, in association with the previous one. You can use this as a stand-alone activity to get learners thinking of words they know. 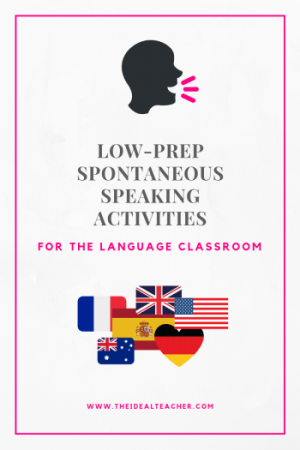 However, you could also combine it with a writing or speaking activity, too. 3. Repeat until you get bored! This vocabulary builder was used as a starter to a creative writing activity. 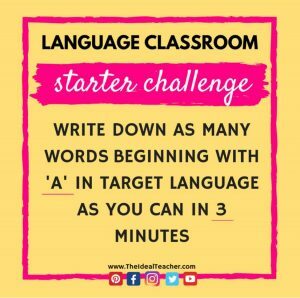 So, if you have time, give the students a sentence starter, such as: ‘It was the first time that I was in a new country, when suddenly someone tapped me on the back…’ You can choose a sentence starter that fits with your class and their level. However, this worked so well and really got my students writing spontaneously, but creatively at the same time. Win-win I’d say! 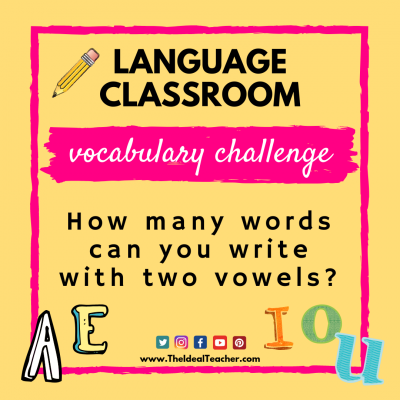 This might seem like a really simple and ill-thought out vocabulary challenge. However, try it out. It’s a brilliant idea and gets students so motivated. You can play as a whole class, perhaps as a plenary, or you can put students into small groups with mini whiteboards to compete against each other in small teams. 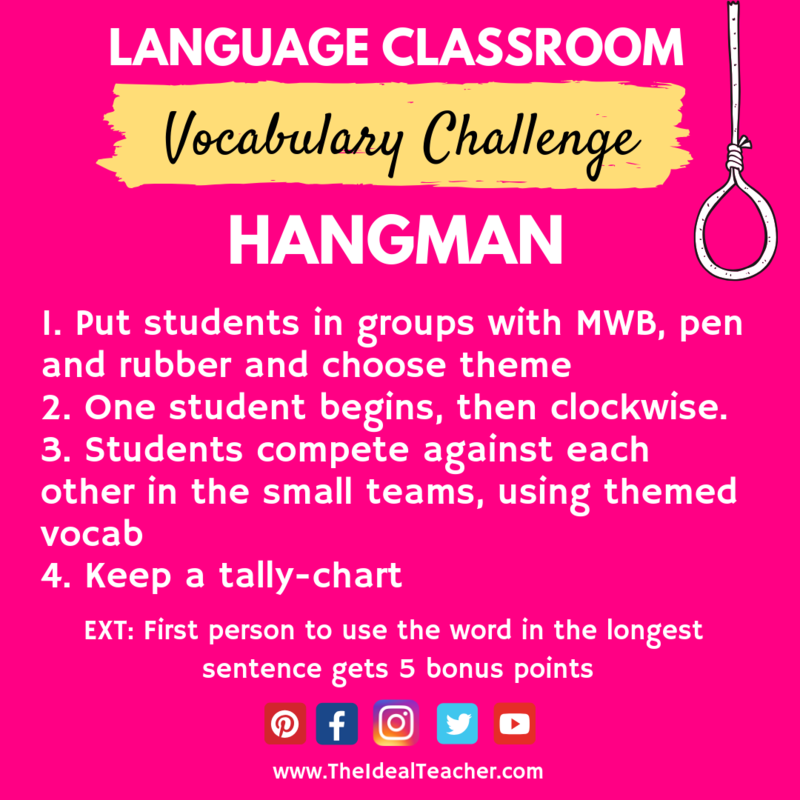 If you are unsure on how to play hangman, check out the rules in the link. Students choose who begins, and then go clockwise. Keep a tally-chart and get the winners from each team to compete for an overall winner. 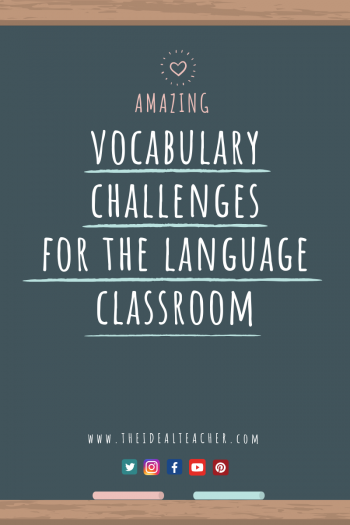 Try some of these vocabulary activities out in your classroom this week and let me know how you have adapted them. Do you have any other suggestions for additions? I will be adding to this page regularly and would be happy to let you know when I do. Why not join TheIdealTeacher.com’s exclusive mailing list below to keep up-to-date with all of my latest content, including fab teaching ideas and activities!